It's time to dive back into the namesake of this brand, data poetry. My posts have diverged from this for a bit, simply because Tableau Conference provided a number of ideas to response and discussion. However, the idea of poetry as a visually-analogous paradigm for data viz still has a lot of content for discussion. If I'm going to sustain any comparison between poetry and data visualization, we've got to talk about rhythm. No poetry workshop is complete without a discussion of rhythm, and no discussion of rhythm is complete without a discussion of We Real Cool by Gwendolyn Brooks. Click play below for the reading (with about 90 seconds of awesome commentary, too). You can read along here. It's obvious why this poem is celebrated as the epitome of rhythm. The repetition of "We" establishes a sort of beat, and, if you read along, you noticed that the "We" is at the end of each line, breaking the sentence up across lines - which propels us from line to line and stanza to stanza. However, one of the most powerful things about this poem is how she breaks the rhythm at the end. It cuts short, which sends a powerful message given the context. In breaking the rhythm, she actually flipped the meaning of her poem. Brook's design of rhythm is what makes this poem - and there's no reason our visuals shouldn't incorporate the same design elements to create smoother, more aesthetic interfaces and to aid analysis of the data. Most simply put, rhythm is repetition. It creates movement and flow, and is strongly related to concepts like literary cadence (or the visual cadence that our designs can have). Rhythm creates expectations, which can help us understand progression and movement and serve to guide us through a piece, whether auditory or visual. This can help create or reinforce an interpretation and thematic elements. Of course, like Brooks did at the end of her poem, we can also betray expectations by diverging from the traditional pattern. This creates a sort of suspense, draws attention, and can even change meaning. Visual Rhythm teaches us how to interact with and interpret designs. We hear a lot of best practice tips like maintain consistency in color meaning, location of filters, the meaning of icons, etc. All of these can be thought of as rules of visual rhythm (and also add an aesthetic appeal), and they help us intuit what we're looking at and how it works. This dashboard is so aesthetically pleasing and engaging, and I could write an entire post on it (especially the mathematical properties of the shapes, and why we find those so brilliant). But for me, the real brilliance is in the rhythm. These visualizations are very atypical - these aren't the bar charts we're used to. However, the rhythm of the shapes mean we only need to learn how to read it once, and then the repeated pattern guides us to understand the repeated elements (this is true with color use, as well). This particular rhythm also creates a very appealing aesthetic element that makes data about poop pleasing enough for viewing pleasure. Notice, though, the break from the rhythm at the bottom. Too much of anything can get boring, and the design changes tempo to create a new rhythm. These charts offer a different perspective, but they also serve to keep us engaged with a little bit of something like surprise. 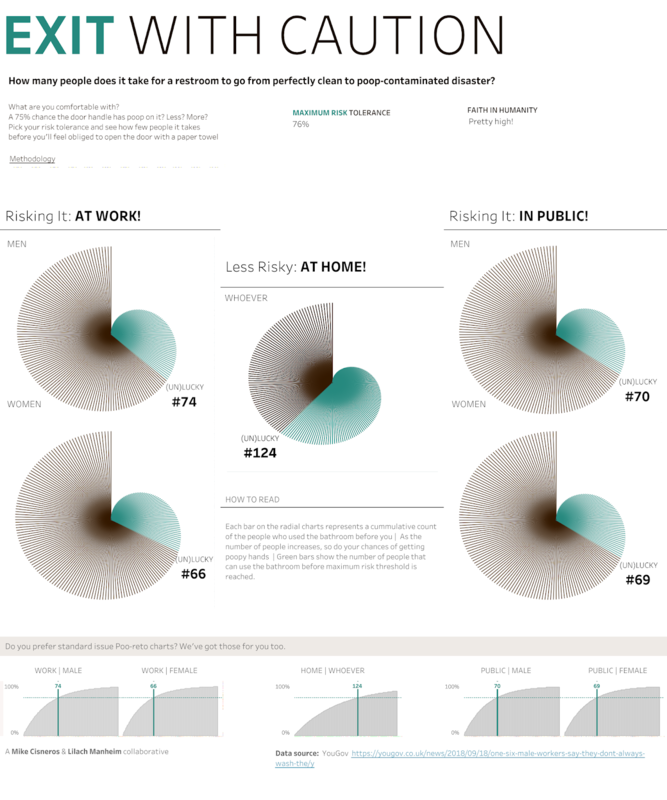 There's a wide variety of reasons why this work is clever and gorgeous, and was rightfully selected as another one of Tableau's Viz of the Day. 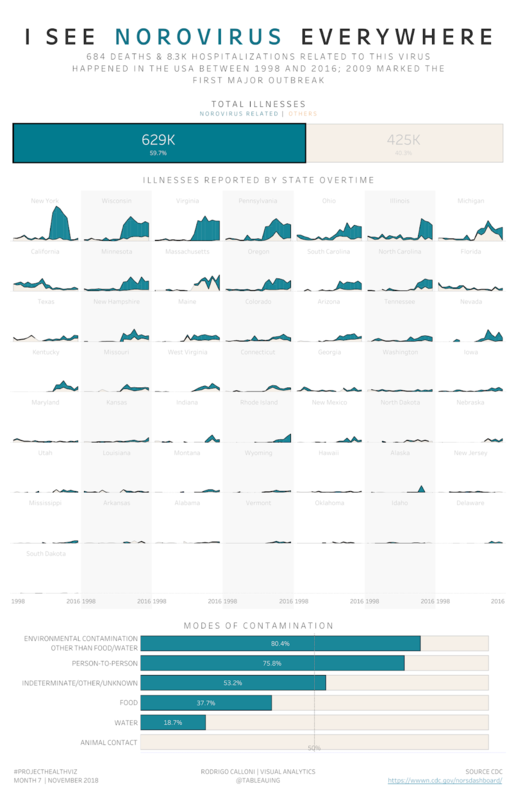 Rodrigo's design creates a visual rhythm with chart type, organization, and color, but it also does a really good job highlighting a rhythm in the data that's consistent across space at a point in time: the 2009 outbreak of Norovirus. The rhythm helps us see a pretty consistent pattern across states, and serves to enforce a natural interpretation of the data. The rhythm is what makes it clear that something definitely happened in 2009. You can imagine each spike on each chart being like the beat of a song, or the stressed syllable in a line of poetry. Of course, the best, or the spike in cases, isn't the same intensity in every state - but rhythms can fluctuate from a steady beat. And speaking of rhythm fluctuation, there are multiple types of rhythm - all which can serve different elements of our design and analysis. What we saw above would be considered regular rhythm, where a single "beat" or pattern is repeated. However, there are other kinds of rhythm that don't just create movement, but also acceleration (or deceleration). In part II of data rhythms, I'll highlight four kinds of rhythm: regular (which we just saw), alternating, progressive, and random. Each of these rhythms have analogies aesthetics and design choices, and they are also ways we can think about and understand data. Stay tuned until next time (and 2019! ).